GIVING BACK TO AMERICA’S HERO’S. THAT’S WHAT OPERATION TROOP SALUTE IS ALL ABOUT. With Operation Troop Salute, both active duty members and former military personnel of the U.S. Air Force, Army, Navy, Marines, National Gaurd and Coast Gaurd can save big on new Ranger models purchased from an authorized Ranger Boats dealer. Operation Troop Salute incentives, include a custom clothing package and $2 dollars per horsepower rebate. 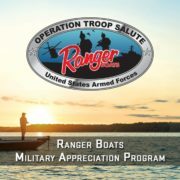 Current and former Military Personnel can receive a factory rebate and exclusive Ranger clothing package with the purchase of a qualifying Ranger boat package during the Ranger Boats’ “Operation Troop Salute” Military Appreciation Program. Current and former Military Personnel may receive the incentive if they meet the eligibility requirements, as outlined below. Eligibility: Anyone that meets the requirements outlined below and is currently serving in the U.S. Armed Forces, is retired from the U.S. Armed Forces or has previously served in the U.S. Armed Forces. An Incentive will be given to any eligible purchaser of any qualifying Ranger boat package purchased from a participating authorized Ranger boat dealer and delivered to the eligible purchaser between January 1, 2017 and December 31, 2017 (see below). A qualifying Ranger boat package consists of a new Ranger boat, motor and trailer that has not previously been warranty registered. It includes 2017 model year and prior model year boat packages. It does not include demo/memo, prize, previously warranty registered, commercial or government use boat packages. The qualifying Ranger boat package must be purchased from a participating authorized Ranger boat dealer. The qualifying Ranger boat package must be purchased between January 1, 2017 and December 31, 2017. It must also be delivered to the eligible purchaser within that timeframe. No rain checks or extensions will be allowed. The authorized, selling Ranger Dealer must warranty register the qualifying Ranger boat package purchased. The eligible purchaser must complete and submit to Ranger Boats an Operation Troop Salute Affidavit of Purchase within thirty (30) days of warranty registering their qualifying Ranger boat package purchased. No other Ranger Boat offers can be used in conjunction with this program, with the exception of the following retail promotions: 2017 Gear Up & Go, 2017 Reata by Ranger, 2017 Saltwater Series and 2017 RT/Deep V Bonus Offer. The Incentives are not redeemable for cash. Ranger Boats will make all determinations regarding eligibility and satisfaction of requirements relating to this Program. Ranger Boats’ determinations are final. NO EXCEPTIONS to this Program will be made. 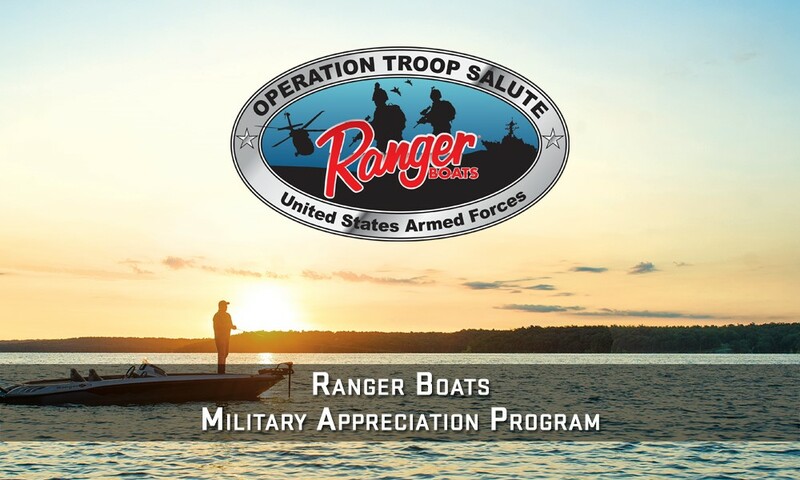 Ranger Boats reserves the right to modify or terminate the “Operation Troop Salute” Military Appreciation Program, in its sole discretion, at any time. CLICK HERE to visit the “WE LOVE OUR TROOPS” message board.